Mono County is your gateway to High Sierra hiking & backpacking routes that offer some of the finest mountain scenery in the United States. Hundreds of miles of trails wind through the Inyo and Humboldt- Toiyabe National Forests, including the John Muir, Ansel Adams, and Hoover Wilderness. This is a land of 14,000 foot peaks, clear blue mountain lakes, glacial carved canyons, and granite cliffs. With an average elevation of 7,000 ft. (2134 m), U.S. 395 gets hikers and backpackers to the scenery, quickest. 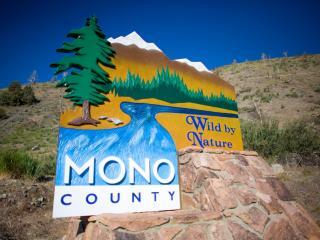 We have all the information you need to start planning your hiking trip in Mono County, today! Everything from Permits & Fees and Rules & Regulations, to Top 10 Hiking Trails and Trail Conditions & Reports. We have a list of Hiking Essentials, as well as local Gear & Rental shops throughout the county as well that are waiting to provide you with excellent service and all the gear you need to make your trip spectacular. We also have information on some of the most popular hiking destinations in the country, including the John Muir Trail, the Pacific Crest Trail and Mt. Whitney. These pages are full of useful information on these trails, things to see along the way, the permit processes and of course, beautiful pictures. So look around! Explore! See all the things Mono County and the Eastern Sierra has to offer. If you have any questions that these helpful pages perhaps didn&apos;t answer fully, give us a call! One of our helpful and friendly staff in our Visitor Centers will be more than happy to help you plan the perfect trip. We look forward to seeing you in Mono County and exploring the beautiful, majestic and one-of-a-kind scenery in the Eastern Sierra!